In the recent post “Shanghai exiles“, I mentioned our meeting with Isabelle and Raymond Chao. Isabelle talked about a friend who owned a Harley Davidson in late 1940’s Shanghai. 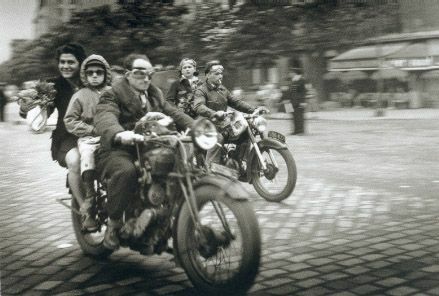 As I regularly drive up the Bund with my 1930’s sidecar replica, I could relate to this very well although I did not see any picture then. It’s a few weeks later that I received the enclosed picture. 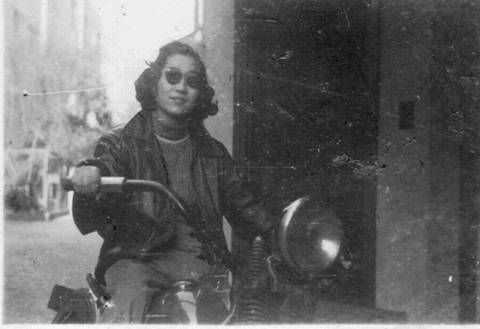 This is Isabelle on the Harley-Davidson in Shanghai, around 1948, a very different look from her picture on the above mentioned post. With sun glasses and leather jacket, there is something really cool about this picture. This is one of he quintessentially American looks later seen the 1955 James Dean’s “Rebel without a cause”, or 1980’s Indiana Jones series. 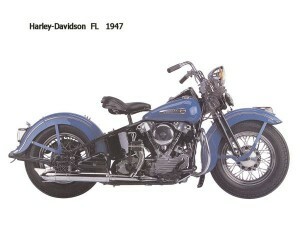 After some research, I guess this motorbike was a Harley Davidson FL. Picture left is 1947 model, 1948 was very similar. The V-shaped twin cylinder 1200cc 51 HP engine is very different from the 750 flat boxer engin on the 1938 BMW R71 that was the original master for my Chang Jiang sidecar. However, the period look of the Harley has similarities with the BMW one and I am sure the feeling driving it down the Bund must not be very different. Isabel’s picture also reminded me of one of my favorite motorbike picture, Robert Doisneau “Les motocyclistes”, shot in Paris in 1953. Although both pictures have a similar feel and were taken only 5 years apart, at that time Old Shanghai had already ceased to exist.